Dr Gene Sherman AM is Chairman and Executive Director of Sherman Contemporary Art Foundation. She was formerly Director and Proprietor of Sherman Galleries, representing major artists across Australia and the Asia-Pacific region (1986–2007). She is Adjunct Professor, UNSW Art & Design (formerly COFA); inaugural patron of the Designers Circle for the MAAS Centre for Fashion; and a board member of The Australian Institute of Art History (since 2013) and Sydney Contemporary (since 2014). Dr Sherman is Co-Chair of the Tate Asia-Pacific Acquisitions Committee and a member of the Tate International Council; a member of the International Association of Art Critics; and an Asialink Asia Literacy Ambassador. The Foundation is a member of CIMAM, the International Committee of ICOM for Museums and Collections of Modern Art. 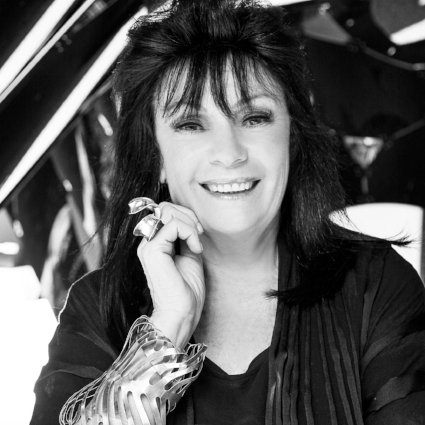 Dr Sherman’s awards include the B’nai B’rith award (2014), Member of the Order of Australia in 2010 for her cultural philanthropy and her support of emerging and established artists, and a Doctorate of Letters honoris causa by the University of Sydney (2008). The French Government has acknowledged Dr Sherman with two awards: the Officier de l’Ordre des Arts et des Lettres (2016), and the Chevalier de l’Ordre des Arts et des Lettres. Marian Hosking has been creating work for almost 50 years, one of Australia’s most respected jewellers and metal smiths . In 2007 she was named ‘Living Treasure: Master of Australian Craft’ and in 2012 she won the Cicely & Colin Rigg Contemporary Design Award. Hosking studied Gold and Silversmithing at RMIT, in the 1960's, going on to complete her Master of Arts, Research in 1996 and her PhD at Monash University in 2009. She has lectured and taught internationally. Now retired after eighteen as Senior Lecturer at MADA, Monash University. Marian’s distinctive work translates imagery from the natural environment through drawing, fabrication and casting techniques. She says “I make jewellery that references specific botanical specimens and birds, I do not always replicate them in an illustrative way, allowing the viewer/wearer to place his or her own reading onto the work." Marian lives and works in Melbourne, Victoria. Nellie Castan has been active within the visual arts since 1980 when she became a partner in the decorative arts focused Distelfink Gallery. In the mid-90s Nellie became involved in Flinders Lane Gallery which sparked her interest in opening her own commercial gallery, Nellie Castan Gallery opened in 1999. In December 2013, after 15 years in operation, Nellie Castan Gallery closed its doors and became a project based business. Since then, Nellie Castan Projects has focused on private art consultancy and promoting artists through international art fairs and offsite exhibitions. Shane Kent is a ceramic artist and teacher. He trained as a potter in Japan and Australia before completing a Bachelor of Fine Art (Ceramics), post-graduate studies in sculpture and education, and a Masters in Drawing. He taught the Diploma of Art (Ceramics) at Box Hill TAFE from 1989-2011. Kent has also undertaken significant commissions for restaurants including tableware, lighting, bespoke tiles and ceramic installations. Exhibiting since 1985, he has been represented by Australian Galleries since 2011. Kent established the School of Clay and Art (SoCA) in Brunswick in 2015. The ceramics and drawing programs at SoCA are informed by his intention to inspire and nurture creative emergence, open up ways of seeing, bring awareness to creative processes and foster the independence necessary to a sustainable art practice. Gregory Bonasera’s passion for ceramics started early in his life fostered by his parents when they replaced his much loved plastic toy potter’s wheel with a real one in 1975. Carrying this love for his craft into adulthood, Gregory has been practicing as a designer-maker since graduating from Monash University with a Bachelor of Arts Degree in Ceramic Design in 1988. His final year portfolio consisted of furniture, lighting and sculptural toy robots made from slip cast porcelain, steel and cast glass. Early in his professional career, Gregory was awarded a three month studio residency in Northern Italy in 1991 through the Australia Council’s Visual Arts Board. Throughout his 25-year career, Gregory has continued to hone his skills as a designer and artisan, he now works in partnership with industrial designer Anthony Raymond with whom he owns and runs internationally renowned brand, Porcelain Bear Australia. An early adopter and local pioneer of CAD design in studio ceramics, Gregory’s work has been exhibited in Europe, the UK, the USA, throughout Asia and locally. Porcelain Bear continues to increase its international reputation as one of the most influential brands producing unique porcelain lighting, furniture and objects. Sarah Bond is a committed arts professional who is active in the access, presentation and engagement of contemporary Australian art for all audiences. Sarah has a diverse skill-set gained from over 20-years’ experience in producing contemporary art projects for national and international (particular interest in Asia) audiences. Her diverse presentation approaches and interests are attributed to her work as a curator, producer and artist. With expertise in design, craft, new media, painting, installation, photography and performance art, Sarah has a wealth of international exhibition and artist residency experience and stakeholder management. As the current Director of Asialink Arts Projects, Sarah has developed over 50 projects for presentation in Asian and Australia public and commercial galleries and museums. Her understanding of exhibition design has been informed during her 11 years of designing exhibition installations for a diverse range of spaces in over 15 countries ranging from Turkey to Vietnam. Sarah contributes to journals and advisory boards and is the current Chair of National Exhibition Touring Services (Victoria) and has an informed knowledge in regional touring, audiences and sector development. Lousje Skala holds a Masters Degree in Visual Art and a Masters Degree in Fine Art, both from Monsh University, and undergraduate qualifications in Art and Design from RMIT University. She is a practicing contemporary jeweller, exhibiting nationally and internationally. Her work has been acquired by important art institutions and private collections including the Musee des Arts Decoratifs, Paris. In 2013 she was selected by the National Gallery of Victoria to exhibit in Melbourne NOW. Lousje has been the Chair of Craft Victoria since September 2016 and has sat on the board since 2014.